A form of prayer in which a structured attempt is made to get in touch with and to deliberately reflect upon the revelations of God: The objectives of Christian meditation are to increase the personal relationships based on the love of God that marks Christian communion. 1. A typically self-directed practice for relaxing the body and calming the mind: Most medical meditation procedures have come to the West from Eastern religious practices; especially, from India, China, and Japan, but it can also be found in many other cultures of the world. Until recently, the primary objective of meditation was religious, although its health benefits have also been recognized, and so during the last decades, medical meditation has been explored as a way of reducing stress on both the body and the mind. 2. A state of consciousness in which an individual strives to eliminate environmental stimuli so one's mind has a single focus that produces a condition of relaxation and a relief from stress: Dr. Diedrich told June, his patient, that the primary objectives of medical meditations are to clear her mind of stressful outside interferences. 1. To concentrate the brain on one thing, in order to aid mental or spiritual development, contemplation, or relaxation: Some people have a ritual during which they meditate and think deeply or focus their minds for a period of time, in silence or with the aid of chanting, for religious or devotional reasons, or simply as a method of repose. 2. To think about something carefully, calmly, seriously, and for some time: Too few people set aside enough time to meditate before they make important decisions. 3. To plan, to devise, to consider: The congressman who is running for office is meditating a response for his critics. 4. 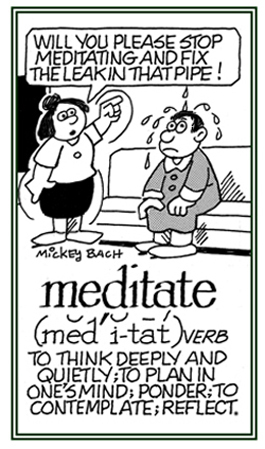 Etymology: from Latin meditatus, the past participle of meditari, "to think over, to consider, to reflect". © ALL rights are reserved. A method of achieving relaxation and consciousness expansion: The use of meditation therapies involve focusing on a key word, a sound, or an image while eliminating outside stimuli from one's thoughts. Meditation therapy is a physically calming treatment for the body and mind and some clinical trials have shown that such procedures can be a valuable therapy for reducing stress levels and in helping to treat stress-related disorders. A reference to the contemplation of spiritual matters; usually, on religious or philosophical subjects: Amanda wrote a book about the meditational lives of various individuals and religious groups. A reference to deep thoughts, close attentions, and contemplations: Some meditatious considerations are important when people are thinking about their current and future lives. 1. Disposed to, marked by, or indicating thoughtfulness: It was obvious that Annette was in a meditative mood. 2. A reference to being deeply thoughtful, reflective, and contemplative: Each evening, the family listened to meditative music so they could focus on the positive aspects of life. A descriptive term that involves deep thoughts: Vincent and Beatrice gazed meditatively at the night sky with all of the stars and full moon clearly visible while they were thinking about the blessings of the universe. Someone who practices concentrating and focusing on sounds, visualizations, and movements: Ryan, who was a meditator, practiced to increase his awareness of the present moment in an effort to reduce stress and to promote relaxation. Lelia and some other meditators direct their attention to breathing and the repetition of mantras (repeated words or phrases) in order to achieve higher levels of spiritual awareness. The mingling of other activities after focusing on practices or techniques of concentration and contemplation: Postmeditation involves the participation in breaks during which a person walks or moves around, eats, sleeps, etc. ; however, one's meditative objectives are still expected to be continuous and should be free from distractions and confusions.